Found one file extension association related to PerfectTablePlan and 1 file format developed specifically for use with PerfectTablePlan. Developer / company: Oryx Digital Ltd.
PerfectTablePlan is the quick and easy way to produce a table seating plan for your wedding, party or event. Just add information about your guests (including who should sit near who), decide the sizes and shapes of the tables and click on the automatic layout button. PerfectTablePlan will assign guests to tables for you. PerfectTablePlan can also recalculate a new table plan if you get cancellations, saving you a lot of stress. It is so much easier than spending hours scribbling on bits of paper! PerfectTablePlan can even import guest lists from other applications, such as spreadsheets and address books, so that you do not have to type in all the guest information again.. 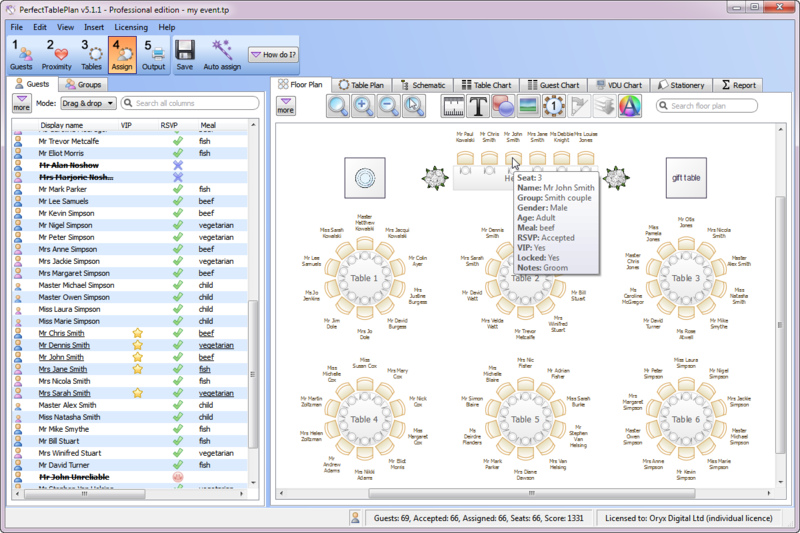 Perfect Table Plan software. PerfectTablePlan - software for table plans. Design and print a table plan for your wedding or event on your PC or Mac. If you need more information please contact the developers of PerfectTablePlan (Oryx Digital Ltd.), or check out their product website.